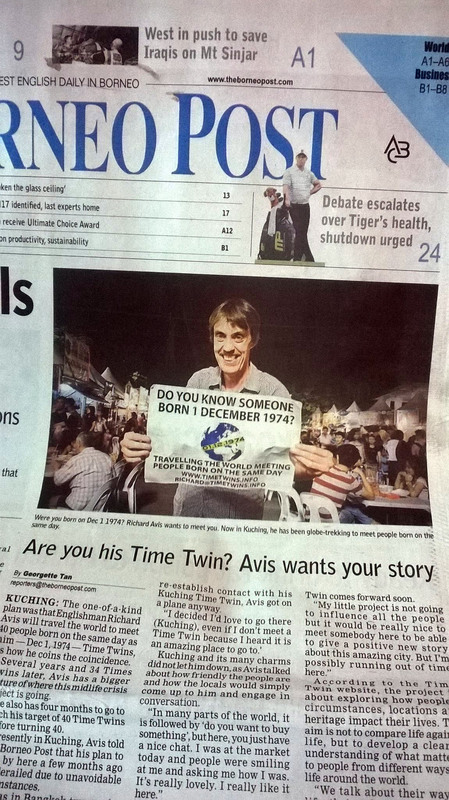 It was quite a coincidence that that I read about Richard Avis and his Time Twin project somewhere online days before his email and press release landed in our office inbox while I was on duty. He was coming to Kuching. I had a brief email exchange with him about arranging an interview while he was here and sent the press release in. 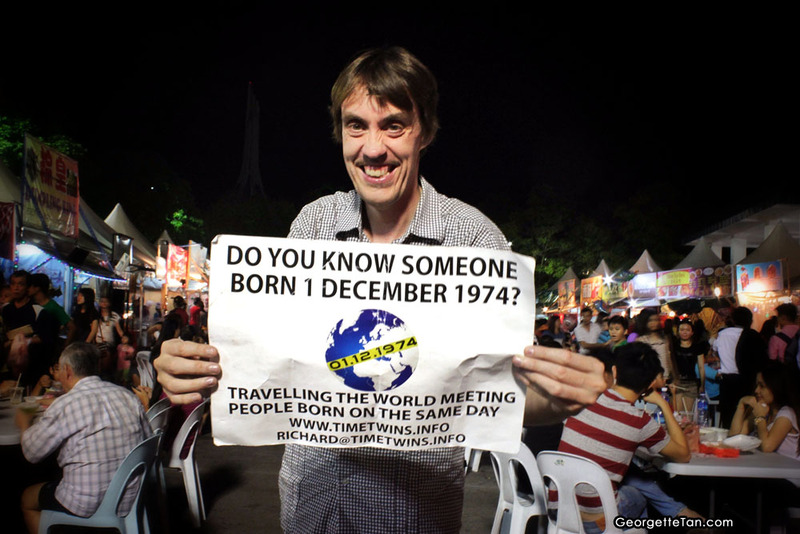 If you missed the story, Richard is going around the world meeting people who were born the same day as him. He wants to know what their lives are like, what they consider their greatest achievement and how they define success. This was months ago. When I didn’t hear back, I assumed that he didn’t find a Time Twin here or he had to be somewhere else first. Fast forward to last week, when Cyn and I decided that we wanted to eat lunch at McDonald’s in the city centre. As we were returning to my car, I saw a tall angmo walking by. Something about him looked so familiar but I didn’t put it together until he was gone. It was Richard! He was in Kuching? I checked the office email for a message but didn’t find any. I emailed Richard anyway, asking if he was in town and it was him I saw walking by McDonald’s. He replied in affirmative some hours later. After a failed attempt to meet at Kuching Food Fest, we traded phone numbers and left it up in the air. I didn’t want to disrupt his schedule by demanding an interview and I didn’t want to mention this to the chief in case I don’t get the interview. After some more exchanges on WhatsApp, we decided to try to find each other at Kuching Food Fest again. He wanted to go a second time, and Cyn and I wanted dinner after we saw a man about a dog (but that’s another story). It was a bit tricky; he didn’t know what I looked like so it was up to me to spot him. 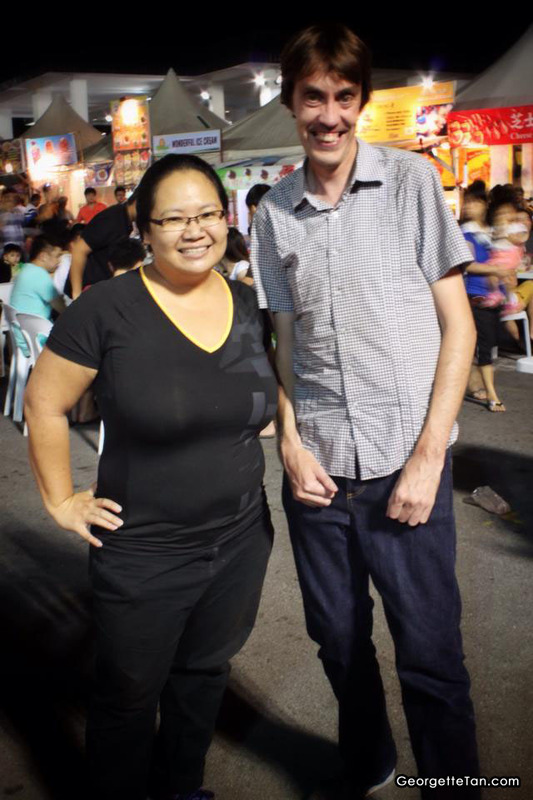 We bumped into him around 8pm next to the Taiwanese sausage stall, after he procured some dinner. We found a table, which is a miracle being where we were, and Richard told us about his adventures so far. He also told us he received one response after my original article, but the Kuching Time Twin did not reply Richard’s most recent emails. I asked who this person was because Kuching being Kuching, there’s a good chance that we’ll have mutual friends. He showed me the guy’s Facebook profile. And it was a face I knew but didn’t manage to put my finger on either. However, the Kuching Time Twin did have someone on his friend list that we knew, so Cyn contacted him. Later on that night, thanks to my FB friends, I found out why the guy looked so familiar. Since we never got to speak to him, I won’t name him here. 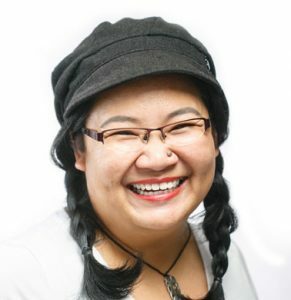 Cyn also made some progress with her contact, and have sent the necessary info to Richard. Meanwhile, I got to work on the article. I was surprised to find it on the front page on Monday. This is nice for me too. I was excited about this story and I haven’t had anything on the front page in years because I write the small stuff that gets buried in the back pages. Who cares as long as I get paid at the end of the month. Richard is probably back in KL now but if there are other of his Time Twins out there, go visit his website to see what he’s all about. Don’t you want to know what people sharing your exact birthday are doing with their lives? One of the rare times I asked to be photographed with my interview subject.